When we picture the future of the office workplace, we have a tendency to think about how far technology can reach and wonder if we’ll sit in front of a holographic screen and be able to create documents with the wave of our hand or even a thought. But what we miss is the human aspect and what we forget is how important collaboration is to a business. Although more businesses today are seeing that there is a value to collaboration and allowing people to work together to come up with new ideas and solve problems, there’s still a serious problem in most office work spaces in that there aren’t spaces available for people to collaborate. Most offices still have everyone sectioned off in their own cubicle which limits their ability to easily collaborate with others. Many offices may think that the answer to this problem is to add more stuff and create places for employees to collaborate where there wasn’t anything before. However, more stuff does not necessarily mean more productivity, and creating additional spaces specifically for collaboration may actually hinder the natural flow of collaboration by limiting it to certain areas of the office. Natural collaboration allows both discussion and visualization to happen anywhere and at any point in the day. Humans have a natural drive to communicate with others to solve problems and come up with new ideas. In fact, one study done in 2012 found that 88% of participants preferred going to the office to work compared to working at home, even when they had access to the same technology, a clear indication that it was the people they were going to work for, not the technology. One area in which collaboration was previously put to a halt was in business meetings. Many of these meetings consisted more of one person presenting information to others with little space being given to discussion and collaboration over their ideas. However, now many offices are allowing their meetings to truly be that: a gathering of people who are able to freely share their opinions and ideas with others. While there is certainly still value in private spaces that allow for isolated focus when necessary, an office that wants to infuse more natural collaboration into their work environment need to consider design changes which can start with office furniture. Fortunately, there is a wide variety of office furniture available today that can help employees collaborate and improve productivity. 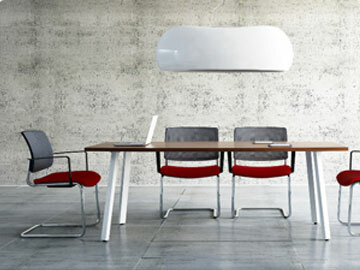 One example of this in action is choosing a triangular table for conference rooms rather than a rectangular one. There are several ways that this promoted collaboration. Firstly, it allows those seated around the table to be able to better see everyone around the table, especially when compared to rectangular tables. It also helps participants keep focused on any remote participants that can be seen on the media wall. Another example of how collaboration can be allowed to flow freely in the office space is in the form of how media tiles are set up. Screens were traditionally put side-by-side, so viewers would have to move their eyes or turn their heads from side-to-side to focus on the multiple remote participants. However, this could be perceived as negative by participants, so a simple switching of these screens to be on top of each other can easily create a more positive environment. The brightest future of the office exists in a space where humans are able to use technology to bring more people together than ever for greater collaboration,. This can start by changing the way we think about our office furniture and making it work for us, to bring us together rather than leaving every man to fend for himself.